Rebecca was so brave and such a great sport with this parrot doing this crazy dance on her head by the beach. During the big snow storm this week, what better to do then to cozy up with a nice 500 piece puzzle set of an Island Beach (and dream of being there--somewhere warm and fun). 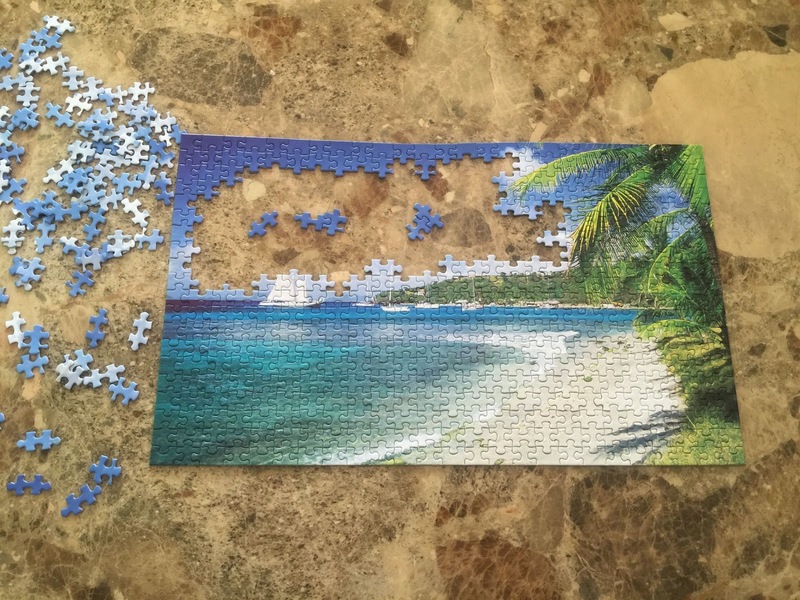 The challenge with this puzzle was in differentiating the oodles of pieces making up the blue sky from those of the blue water. Similarly, with all the green pieces for the palm trees and all the white ones for the sand. It seemed as if all the pieces were just shades of similar colors, and hard to differentiate between them. But my daughter is so smart and determined. First, she strategically separated out the pieces with the edges and put the whole frame together. Then, she organized the rest of the pieces by their associated colors, so sky blue pieces would be in one pile and distinct from ocean blue pieces in another one and so on. As you can see, all that's left is to finish off the sky, and it's done. I was able to find a few pieces, but I'm better laying at the beach, then putting one together. I miss you, but I have this great mug ala Starbucks to remind me. Rebecca got me on another mini-adventure today. The T-Rex scooter had only 3 wheels, but packed quite a punch. We navigated Las Olas and the Fort Lauderdale Beach pretty good in this thing. So low to the ground, my hand could touch it, and no windshield so everything sort of just flies right through.